Forecaster nowcasting at the synoptic scale is rapidly being replaced by the numerical weather prediction models. However, there are plenty of opportunities for you as a forecaster to improve on those forecasts with simple comparisons of water vapour hand analyses and surface hand analyses. The goal of this lesson is to improve your skills in water vapour and surface analyses to evaluate the three-dimensionality of the atmosphere and thus forecast the sensible weather better. This is the capstone for the entire Satellite Interpretation distance learning course. Need better examples to show main points. things on quiz not mentioned in module. quiz examples were not very good and quite subjective in some of the satellite interpretation. Develop a three-dimensional, atmospheric mental model using surface and water vapour analyses. Diagnose differential vorticity advection based on the slope of vorticity tubes by comparing surface and water vapour analyses. Forecast sensible weather based on this diagnosis. Diagnose ana- and katafronts based on surface front and upper-level deformation zone overlap by comparing surface and water vapour analyses. Diagnose dry conveyor belt pulse deepening based on darkening water vapour imagery. Forecast sensible weather changes based on this diagnosis. 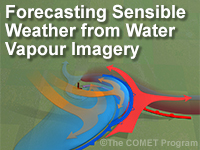 Synthesize information from water vapour and surface analyses to write a forecast.